on verso titled and dated 1955 on the labels and inscribed "3-3"
A dominant figure in the history of abstract painting in Canada for six decades, Guido Molinari was always an original and, most importantly, an innovative artist with an independent voice. Looking back, 1955 was Molinari’s breakout year, the year when his work and writing catapulted him to leadership in the art scene in Montreal. The year began with a short trip in January to New York - his first. There he encountered the works of Wassily Kandinsky at the Museum of Non-Objective Painting, Piet Mondrian at the Museum of Modern Art, and he most likely sought out paintings by Kazimir Malevich as well as those of the American Abstract Expressionists. He had a particular interest in Jackson Pollock, an artist he had followed closely since first reading about him in Life magazine, and Mondrian, again from an article read in his youth. In New York, Molinari encountered abstract art that was different to the abstraction familiar to him from the Montreal Automatists, and it had a decisive impact. He articulated his thoughts in one of what were to become many, now seminal texts on abstraction: “L’espace tachiste ou Situation de l’automatisme.” And then, only a month later, in May, he founded the first gallery in Canada devoted exclusively to abstract art, Galerie l'Actuelle. 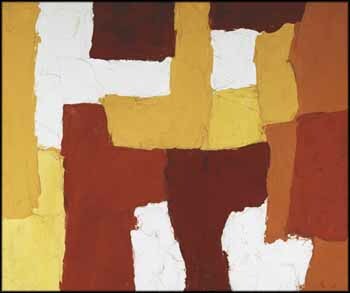 Sans titre from 1955 can be seen as his direct application of the ideas engendered by this first-hand encounter with abstract art. Molinari began using broad slabs of pure colour, applied thickly with a palette knife. They were both his building blocks and the solution allowing decisive action, “to destroy volume by using the plane, to destroy the plane; and, further to destroy lines through mutual opposition,” as he stated. In Sans titre Molinari divests the canvas of all traces of illusory space and moves beyond a compositional structure of figure/ground. He instead sets out blocks of thick paint that in form mimic, echo and mirror each of the other blocks across what remains a single unified surface. He experiments with this chromatic form of abstraction, using a restricted, monochromatic palette of a few pure colours and white. Each colour/form is placed next to another colour/form on the canvas to create a wholly new all-over painterly space. Molinari has spoken of this field as a dynamic space to be activated by viewers as a new experience. The coloured areas of the painting create equivalences with each other. No single colour sits on or in front of any of the adjacent colour areas. No pictorial depth is invoked, but instead each colour is held in tension by the other blocks of colour. This dynamic tension between space, form and colour relies on the mutual opposition of blocks of colour that share a single surface. In fact, every colour in Sans titre is on the same plane, the same surface - any suggestion of depth is a result of the physical abutment of pigments overlapping where the thick slabs of colour meet or where one hue has been applied directly on top of part of an adjoining colour. Molinari was creating a new painterly space, a robust physical all-over composition. The space in Sans titre is not guided by line or any geometry internal to the painting but exists as a dynamic space activated by the perceptions and decisions of each viewer. In a sense Molinari creates a painting event, something temporal, and something chromatic to share with viewers in real time. With Sans titre, Molinari achieves a purity of colour and an essential form which already separates his work from those forms of expressive abstraction he felt were an impediment to extending the legacy of abstract art. This small painting from the mid-1950s, together with his achievements in black and white from the following year, prefigure that other building block we see throughout his oeuvre from 1959 onwards, the hallmark vertical slabs of colour and simple forms placed adjacent to each other that quickly became his signature stripe paintings. We thank Gary Dufour, Adjunct Associate Professor at the University of Western Australia, who was the curator of the exhibition Guido Molinari, 1951-1961: The Black and White Paintings, shown at the Vancouver Art Gallery, the Art Gallery of Windsor and the Art Gallery of Ontario in 1989 - 1990, for contributing the above essay.